The first time I learnt about The September Project was in late August last year, from a forwarded listserv message. I was excited at how libraries could play a role in reinforcing social awareness and promoting discussions. At that time, I was also exploring how blogs could enhance the library's service to public and it struck me that 9-11 was a good opportunity to test some ideas and concepts regarding blogs. With other colleagues who helped provided ideas and some content, we put this up within 3 or 4 days. Now that's fast, but something I've sort of taken for granted now. You can read about what we did in 2004, and what we're planning to do this year from this post. We learnt a few things from the experiment. We were pleasantly surprised by the quality of the comments when we asked people to let us know what they thought about "September 11". Boy, did they tell it to us. They were frank but all very civil. Nothing was deleted or edited. In fact, a colleague of mine asked if we faked the comments because there were no grammatical or spelling errors. We didn't, I assure you. Another point learnt was that blogging works. I was prepared to take some flak from my bosses 'cos I went ahead to do the blog on my own. Looking back, it was a calculated risk which turned out quite well. Past few days, I've been exchanging emails with David Silver and Sara Washburn (the Project Directors for the project) . Have not met them in person but have been so encouraging and constructive in our (email) conversations. Really nice people. David was curious about why I used the digital element in the event. He asked if had to do with an objective to reach an audience outside of Singapore, or from an inability to have such events in physical, non-virtual spaces? I replied that in essence, the larger objective was turn this into a truly International Dialogue. I believe very strongly that to truly change minds and perspectives, we have to introduce external perspectives, beyond national and geographical boundaries. The digital element is an enabler, as most bloggers know. I mean, how many people can travel outside their country and meet with "X" no. of people in their lifetime? To use a favourite term within NLB-circles, we have to break away from thinking in silos. The tagline that ThinkAbout911 is adopting is "It's about Community, not Geography". I wish I was smart enough to coin the phrase, but I didn't. Discovered it from a related "9-11" blog. I believe it was coined by this fella named Rob Salzman (his site is now defunct, unfortunately). If you have ideas or thoughts to share, I would appreciate if you email me, or post your comments here. Discovered this article from Harvard University Gazette (dated 17 Apr 2003) titled Berkman Center fellow Dave Winer wants to get Harvard blogging: Weblog pioneer preaches the gospel of blog. ... is NOT a comprehensive collection on academic blogs and bloggers. It will be used for two faculty development presentations at Eastern Connecticut State University. If you stumble across this blog and would like to suggest a link, please e-mail Susan Herzog. If scholars are getting into the act, then what are librarians waiting for? Found this website of Omro Public Library (Carter Memorial Library, Wisconsin USA) where they are using a blog to provide timely updates on new arrivals. Their members can choose what they would like to borrow or reserve right from the blog. It's a simple but yet excellent example of how libraries can use blogs to enhance their services to users. Librarians (with access to the blog) can post new content quickly, without having to go through the webmaster and/ or messing with the main library page. Presenting the "what's new" content on a blog is also a much neater way to organise the information, i.e. you don't clutter the main library webpage with too much stuff -- think "Google". But setting up a blog is only half the story. For optimal usage, library members should use newsfeed readers to receive the library's blog content. That way, the library user can receive timely alerts whenever the blog is updated, rather than having to check the library website (or blog) for updates. Without newsfeed readers or aggregators, the blog becomes just another website. What I like about Omro PL's webpage is how they've anticipated that some library users may not know how to use aggregators. So they've included very clear instructions and useful links to allow their users to signup to Bloglines (which I found to be the most user-friendly, in my opinion) plus links to webpages that explain how blogs work, and what is RSS and newsfeeds. Omro PL would not be the only library using a blog, but so far it's the only public library I've come across where they've presented the blog and related information very clearly. Users new to blogging would be able to understand how the library blog & newsfeed reader can work for them. Would you like to find out which novels, movies, childrens' books & more have arrived at our library? Use our brand-new What's New At Carter Memorial Library blog ("blog' is short for "web log") to see what's just arrived, then choose what you'd like to check out or place a hold on the item right from our blog! As often as new items arrive, we'll add them to our blog. If you already use an aggregator like Bloglines to keep up with other blogs, make sure to add our blog's RSS newsfeed! Unfamiliar with the word "blog"? Find out more at How Blogs Work. Unfamiliar with the terms "aggregator", "newsfeed" or "RSS"? Find out more here. Almost eight hours ago, I met face to face -- for the first time -- with two of the organisers of the upcoming "Singapore Bloggers' Conference" -- Preetam and CalmOne. We discussed how the library could support the event, and deliberated on issues like publicity and logistics. In the end, it was pretty clear to me their proposal was doable, and there's no reason why the library should say no. I' m learning more and more about the power of the conversations that's generated by blogs. Shel's post sparked off a discussion -- it's like he stirred up a hornet's nest or woke some dozing lions. Some SG Bloggers took issue with Shel's comment that blogging was non-existent in Singapore a while back. Then Mr Brown deduced that the reason why SG Bloggers appeared to be non-existent was because we were not Technoratifed. Mr B. offered a quick lesson on how to get listed and with a call for other SG Bloggers to sign up in Technorati. The next day, Preetam followed up with a (excuse my language) damn solid tutorial complete with screenshots (which Mr B. updated his previous blog post to link to Preetam. Wah lau eh, if this is not an example of "expanding the learning capacity of the nation", then I don't know what is, man! Another important point learnt was this -- If you want to keep something secret, don't email it. Don't even say it. Certainly don't blog about it!I was pretty excited about the proposal when Preetam contacted me. I mentioned the idea of a SG BlogCon to Shel during an email chat. He got excited and posted in his blog. Frankly, my first reaction was one of mild shock. Like, "Oops, have I prempted the organisers? Stolen the thunder?" They chose not to make their plans public yet but there it was in Shel's blog, with my name. Might create some misunderstanding here, I thought. But today, the two very nice SG Bloggers assured me that it was OK. I believe them :) The activity and posts is indicative of the potential turnout to the conference. Bloggers outside out Singapore are also taking notice. Like Mark Beinstein, who's speaking at BlogTalk Downunder (19 - 21 May 2005). He learnt about the SG BlogCon from Shel's post. Mark says not to hesitate to let him know how he can help. I emailed Preetam and CalmOne to suggest maybe an Instant Messenging session with Mark and other overseas bloggers. BTW, I have to clarify something: Shel's post might have given the incorrect impression that NLB or myself (in my personal capacity) organised the conference. I wish I did, but I didn't. This is entirely a community-initiated effort. I would like to think that I have a wee-itsy-bitsy part to contribute. As an NLB employee, I welcome the proposal as it fits very well with NLB's mission and vision. In my personal capacity as a blogging librarian, i.e. a liblogarian, I'm excited about the BlogCon because I see it as a way to demonstrate to my librarian colleagues what blogging is and isn't. I'm confident they'll come to realise how easy -- and important -- it is to become part of the blogging community. There are a few more SG Bloggers in the organising committee. I'll let Preetam and CalmOne tell you who they are in due time. Details should be out soon. Folks who live in Clementi Town Centre (or plan to move there) would be pleased to know that the town will be getting a swanky new community library, among other developments, in about 5 years' time. About 388 units of new HDB flats. Discovered this excellent post by Robert Scoble, titled Corporate Blog Tip #1 (improving the title tag). It made so much sense that I amended my Blog title right away. It's now called "Rambling Librarian :: Incidental Thoughts of a Singapore Liblogarian". It used to be "Rambling Librarian :: Incidental Thoughts", which after reading Scoble's convincing explanations, I agreed it doesn't indicate the "niche". But I didn't want to lose whatever meager "branding" that Rambling Librarian already has with some other bloggers and LIS-related directories. So I added "of a Singapore Librarian" to the title. Quite a mouthful, but it's indicative of what this blog is about -- thoughts from a Singapore librarian. Problem was the word "librarian" repeats itself and doesn't sound good. *After minutes of indecisiveness, I decided to drop the "r" after "lib" -- less confusing to people. >> What's in a name? 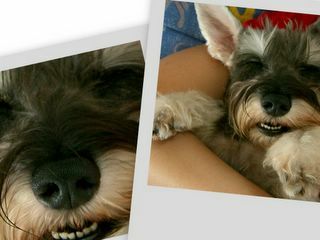 This post by olkgal reminded me of this early photo taken of my dog, Maximus (a Miniature Schnauzer ~ NLBLink 9425982). Didn't he look like Stitch? 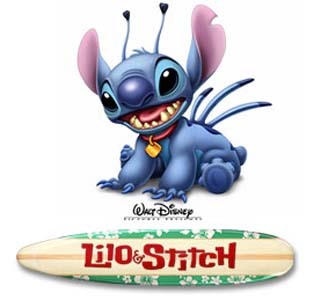 (Disney's Lilo & Stitch ~NLBLink 11792394). I joked with my wife that Max looks like the offspring of a.. ahem... drunken sexual union between an Ewok and a Wookie ~NLBLink 12270570! While thinking of a name for our dog, my wife and I surprisingly came up with the same name, but for different reasons. I was thinking of Maximus, the Gladiator [NLBLink 7821448/ NLBLink 10127342] played by Russell Crowe. My wife too, came up with the name, Max. But she was really thinking about main character in the cartoon series "The Transformers" [NLBLink 11795414], Optimus Prime, except that she mistakenly thought the heroic robot was called "Maximus Prime". The Endangered Lesser Asian Bear-pig (we regularly bring him out for short midnight walks. Under the dim amber lamp lights, with the crickets singing in unison, the way he sniffs so intently at everything -- makes me think of David Attenborough [NLBLink 11636463/ NLBLink 11636463] narrating the some wildlife film for BBC). AN ASIDE OF THIS BLOG: In blogging something as personal and as mundane as the name of my dog, what I'm trying to demonstrate is how blogging can be used as a tool for social networking and expanding the readers' learning capacity. The post was inspired by something I read from another blogger. I left a comment and a link for olkgal's readers to connect to my blog. I've also enabled my readers to be connected to another fellow blogger (who they might not know of). 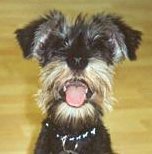 If people google "Miniature Schnauzer", they might get directed to this post. So we're now connecting people with a common interest in Mini Schnauzers, and they are not necessarily bloggers. I intend to send this blog link to my friends and colleagues. They might learn something new -- that I have a dog. And perhaps some of my colleagues are dog owners, or they might forward the link to another person who owns dogs. More social connections. The hyperlinks to websites makes it easy for the reader to learn more about the topic (without cluttering my post with lengthy explanations). Notice the [NLBLink 12270570] tags in the post. These are simply hyperlinks to specific items in NLB libraries. The links will show the item availability as well. It's a way to promote usage of our libraries. In searching for those websites and library items, I'm learning along the way as well. Of course what I didn't mention was the time it took for me to search for relevant links, and to compose this blog. For now, it takes a while but it's something I like to do. A little journey of discovery for myself. And who knows, Blogger (and the many free Blog Tools developer out there) might collaborate with local libraries (like NLB) to incorporate a "Library Linker" add-on or something. Soon after my post on NLB libraries opening longer on weekends, I received a comment from anonymous, who was skeptical that the library was able to extend opening hours without additional costs. I posted a reply, indicating broadly how the libraries were able to do this. In composing the reply, I realised that anonymous was actually right. There ARE additional costs, but not what most would think. The cost here is really the opportunity cost of working on weekends. And the people bearing this cost are my colleagues in the front lines -- the Library Assistants, Library Officers, the Librarians. Sure, someone might point out that staff get compensated (either with an equivalent time-off or overtime pay) for working on weekends, so there isn't a real opportunity cost. But I'd argue that nothing can fully make up for the loss of those weekend hours -- where one could have spent that time with family and friends, or just sleeping in after a work week. Weekends are often the only time most families and friends can get together. Ok, before you think I'm ranting about the injustice of having to work weekends, or that I'm just posting a load of crap 'cos I don't work weekends as a manager -- well, I've done my share of weekends over the years. But that's not my point. My point is that most library front-line staff (i.e. those who are customer-facing or manning call centres, ensuring that libraries for public use are open 7 days a week) are a dedicated lot, whether consciously or not. Sure, some grumble but they trundle on. Most try their damnest to serve library users the best that they can. They do this while dealing with a rising number of rude and ungracious kids and adults, plus the sheer stress of facing the crowds. It's not a glamourous job, and they don't get huge bonuses. Unlike private companies in general, there are no sales profits for getting more customers to come into libraries. Heck, I'm not even asking you to write compliments. I just sincerely hope that you, the NLB library user, remember what your fellow Singaporean is sacrificing. Many years ago (sorry, I'm too lazy to find out when was this exactly, but you could ask Reference Point), public libraries in Singapore (including the National Reference Library) did not open on Sundays. Around mid 1980s (I think), they opened longer on Saturdays (till 5pm, instead of closing at 1pm) and opened on Sundays (1pm to 5pm). Come 1 Apr 2005, public library opening hours will be extended (10am to 9pm, except for libraries in shopping malls which will open from 11am to 9pm), and will stay the same 7 days a week. I've posted the official press release below. Prior to 1 Apr 2005, we have people asking why the library cannot open earlier in the morning, say 9am even (some libraries opening only at 12pm). They don't accept the explanation that library staff need time to put things back in order, especially the messy books left behind by readers who, well, just don't care. Enuff said. I view the extension of opening hours as a good thing. It will mean greater convenience to our users. NLB is extending the operating hours without incurring additional manpower costs, i.e. my colleagues in the front lines now have to work longer on weekends. Most of the frontline staff accept this as part of the job. In anycase, I hope some of the very critical customers out there appreciate this. A thank you or a compliment now and then would not hurt at all. Singapore, 22 March 2005 – In reaching out to more Singaporeans to read and learn and make libraries their next most frequented place after the home and workplace, the National Library Board (NLB) today announced the extension and standardization of operating hours for all its regional and community library branches. The new operating hours of the libraries, located island-wide, will be effective from 1 April 2005. 1. Regional and standalone community libraries will open their doors from 10am to 9pm from Mondays to Sundays. Previously, these libraries closed at 5 pm on weekends. The longer opening hours will allow library customers to use the libraries in the evenings and on weekends as well. This revision will also allow for families to utilise library facilities after dinner, promoting family bonding whilst encouraging the fostering of good reading habits. 2. Meanwhile, community libraries in shopping malls will be open from 11am to 9pm from Mondays to Sundays, in line with the operating hours of shopping malls and catering to the needs of nearby communities. Currently, some of the libraries close at 8pm on weekends. The extended opening hours in the popular shopping mall libraries will allow customers to enjoy the library facilities and materials while visiting the shopping malls. 3. A total of about 2 million people in FY 2003 made on-site enquiries at the libraries island wide, 30% more than in FY 2002. This indicated a rise in demand for library services and availability, and thus, it is timely the opening hours for libraries are extended. 4. Visitorship for standalone libraries saw an average of 7,000 and 4,000 visitors for Saturdays and Sundays respectively, while regional libraries had an average visitorship of 12,000 and shopping mall libraries 10,000 for each of these days. Operating hours have been extended to meet this keen demand for library services, especially over the weekend as more people are moving into the five day-work week. 7. And as part of its effort to improve customer services, NLB will be moving its National Reference Library on 18 April 2005, currently situated at its temporary location on Levels 2 and 3 of the Jurong Regional Library (JRL), to a bigger and more accessible space at the new National Library building which will open this year. A smaller reference collection will be available in its place at JRL from 9 May 2005 to allow customers to continue to research for information. Customers will be able to access reference materials such as general and subject encyclopaedias, dictionaries, statistical yearbooks, almanacs, directories and newspapers published since 1981 as well as popular educational and business journals and management titles. 8. For more information on NLB’s library branches and hours, members of the public can refer to the NLB website at http://www.nlb.gov.sg or call 63323255. Before The Da Vinci Code, ask anyone if they know the author and chances are they'd say "Dan, who?". Love it or hate it, it's a real hot book. Even though I work in the public library, I had to buy a copy in order to read it! (Actually, my wife bought it). See, it's NOT true that library staff always gets to read the latest copy. We put the customers first. While searching for active Singapore blog discussions (i.e. more than 5 comments and not by the blog owner) about the Da Vinci Code, I realised that majority of posts just mention the title. A few do blog more about it but they generally don't solicit much comments. The exception so far seems to be Idle Days. Actually I'm discussing Dan Brown's book here to address what Damien commented in my previous post, where I suggested librarians should go and join the conversations and book discussions in the Blogosphere. He felt that (1) such an approach might be seen as intrusive, (2) NLB would not "sanction" its librarians to blog if we can't measure the outcomes of librarians blogging, and (3) librarians would be disappointed if their blogs are not read. 1) In any meaningful conversations, there has to be trust among individuals. Key ideas here -- (i) Establishing Trust and (ii) Recognition of Individuality. Librarians cannot pop in and say "Hey, read this book"... well, maybe they can, if they have established trust. If not, they should ease their way into the discussion and not robotically recommend books. Having meaningful conversations means not being obsessed with what you want to say, but to really respond to what the other person is saying. Recognise them as individuals. There's a post by Michael McGrorty that illustrates my point somewhat. 2) I do not need official sanction to blog. And the question of measurement is not confined to blogging alone. I don't need official endorsement to blog. It's like asking "Do I need official endorsement to engage with my readers?" Blogging is a means to an end, which is to engage the public so that we (i) reinforce relationships with exisiting readers, and (ii) establish relationships with non-users/ potential users. I think Damien was asking about how we'd justify our time spent in blogging, i.e. to tell our boss that I've not wasted my time blogging because I've achieved "XYZ" results. The issue of measurement isn't confined to librarians blogging. It's really a question of how we measure the outcomes of librarians engaging the public. Quantitative measures can never address this fully, and qualitative measures aren't really developed for this. Inevitably, I'm sure if we discuss this point further, it would lead to the question, "What can I say, or not say in the Blogosphere?". I did post about this earlier. But here's something from Robert Scoble who conveys the idea subtly but much better than I can. Blogging is not about numbers. It's like the act of reading -- it's not how many books you've read, but how much you gain from reading. Why blog and what makes a blog successful? I have to thank Damien for giving me food for thought. I'd never have gone out and discovered those useful links above on my own. Ah, the power of conversations! Today was one of those days that for everything that I see so many linkages from what I read (blogs and websites) -- hey, kinda like what goes on in the Da Vinci Code! Morning, I came across Idle Days and posted my comments to the blog post regarding Dan Brown's book. Then a couple of hyperlinks later, I came across Chris Anderson's The Long Tail article. This was the second time I read the article but it gave me new insights. By Anderson's definition, Dan Brown's books certainly has a long tail. After Da Vinci Code hit the shelves (or should I say, after the controversy hit the news), all his earlier books were snapped up from the public libraries. It's the same as any other hot title/ author, like Harry Potter and Murakami. Much later in the day, it occurred to me that book discussions are alive and well in the Blogosphere -- just that nobody really sets up dedicated blogs to discuss about books. That's really a cool thing, and it's a sign of times. The traditional Book Club (where members meet regularly to discuss about a book) is getting harder to sustain. So in comes the Blogs, but the difference being that a blogger doesn't blog on books alone. There is no "book club" per se -- only "book discussions". If they read a book and talk about it and others join the conversation, then you have a book discussion. A search in Technorati for "singapore da vinci code" reveals 454 posts (20 Mar 05, 10.30pm). There were 99 hits using the same search term in Blog SearchEngine. Some posts could just contain a brief mention of the title while some could be protracted discussions about the book. It occured to me that this was a new way to find these book discussions (not book clubs). And that's where libarians (public libraries) could go out and join the conversations. Forget about inviting readers to specially make time to join bookclubs in libraries. Librarians should make time and go join the conversations and book discussions in the Blogosphere. You know something - public libraries should take lead in building social networks. People love to talk about books. What better way to link people then to have them list their favourites, their reading list and then let them find others with interest similar to theirs. Add recommendation engines like Amazon - “the people who read this book also read these other books”. We (NLB) recognise that — the social networks part. Not trying to defend NLB or anything but well, just trying to meet our targets for loans and visitors has been tough enough. And not many Singaporeans are comfortable with engaging in conversations with each other people (the very small blogging community may be an exception). That’s the real obstacle in my opinion. But NLB is coming to the end of the L2000 phase of development. Next lap, you’ll see more of the social networking part. We have to. It’s the next logical step and a given really. Upon hindsight, it would have easy to ask why NLB did not anticipated the need for the system to support say, OPAC users, to link and share. Actually I can tell you that as far back as 5 years ago, our librarians were talking about it. We ourselves had high hopes for our OPAC (most consciously or unconsciously using Amazon.com as the benchmark). I don't have enough information as to what went on at higher-level discussions, so I won't speculate. In some ways, the timing might not have been right. Had we provided that kind of feature then, majority of users would not have caught on. It's only in recent years that IM, blogging etc became the "in-thing" of sorts. * I just love his blog name -- "betterdays". Bet he goes around asking "Have you seen better days?" Congratulations to Ms Cindy Fuerst, Library Director of Kankakee Public Library for being nominated to the Movers & Shakers Class of 2005. I had the pleasure of meeting Cindy and her colleagues, Steve (Assistant Director) and Camille (Head of Youth Services) when I visited a friend in Chicago in November '04. It takes a special talent to sell a plan, mobilize enthusiasm for a new project, or create the right partnerships to get a new service off the ground. It might mean convincing a community that a vital library can create an economic renaissance. Or letting the world know what a wonderful career librarianship can be. Or persuading a profession that diversity is everyone’s responsibility. Kankakee PL was one of the libraries I visited. I also dropped by Bradley PL, Bourbonnais PL, Benner Library (Olivet Nazarene University), as well as the Harold Washington PL in downtown Chicago. Most, if not all, of their library staff have a clear "service/ customer-focused attitude" and services are adapted according to the needs of the community. This is really a given in today's context. In terms of the (public library) collection & facilities, the differences could be huge, mainly because of the community they serve or are in (it relates to how they are funded & maintained). The differences between Kankakee, Bradley & Bourbonnais PLs were apparent. Kankakee was better equipped & had newer facilities; Bradley was very small & they said they needed an upgrading; Bourbonnais was expanding. A small community PL like Bradley was very quiet and low-key, as most of their residents work out of town and will only use the library on weekends. How well the public library was funded depended a lot on their community's economic performance. Their PLs are funded by property taxes & state grants. In Kankakee PL's case, I learnt that Cindy, their Library Director*, lobbied hard with the mayor to get funding for upgrading the library. So I'm not surprised to know that Cindy is in the top 50 Movers & Shakers Class of 2005. The people managing and working for the library was key. For instance, Kankakee PL gave me the impression that they were motivated and ehthusiastic about what they do. This was certainly evident in my meeting with Cindy, Steve and Camille. I was told that many of their staff put up with poor work conditions (prior to their upgrading) and did their jobs without complaints. Singaporeans who live/ work overseas, as well as overseas visitors, tell me that Singaporeans don't know how lucky they are that our libraries are well equipped and well funded. Having had the chance to visit libraries in UK, USA, China, Philippines and Japan (all within the last 6 to 7 years), I can honestly say that in terms of the integration of IT, environment, facilities, services and collection, Singapore's public libraries can be safely ranked among the top. Of course there are much we NLB librarians and library managers can -- and have to -- learn from our overseas counterparts. Generally speaking, there's much more individually-driven community initiatives by the overseas librarians, especially the US librarians. As NLB completes the infrastructure-building phase of the past 10 years, the logical step for the next phase would be the "software" aspects like community-linkages and collaborations. It's not that we have not done them in the past, but just that the emphasis would even be greater than before. * Equivalent to our "Senior Manager", though it isn't an accurate comparison because of the difference in how US public libraries and Singapore libraries are structured. An "Open Access", PloS-equivalent for Library Science? Hot off the press from Library Journal: "The Public Library of Science (PloS) will more than double in size this year, with new journals scheduled to be published in June, July and September. They include PLoS Pathogens, PLoS Computational Biology, and PLoS Genetics...". Here's the LJ article. PloS is not exactly new, but it still intrigues me. Its a useful resource -- and as free as it can be -- for medical science researchers. But if you're looking for layman articles like "Cancer cures using Traditional Chinese Medicine"... you can try but might have better luck seeking the help of the public or reference librarians. What intrigues me is the PloS Open Access policy and its principles. Any librarian who has been to the negotiation table with database vendors will agree that we librarians pine for the day when reliable journal databases would be accessible for free. Forget about onsite-only access or concurrent licences etc. Forget about paying high subscription costs to see low usage from library members. Forget about "Subscription Vs Ownership" issues... (see related post -- If Google doesn't see it). Read this in late Feb actually -- ALA president elect, Michael Gorman, wrote this piece in Library Jounal -- Revenge of the Blog People! * It's clear he and bloggers are not exactly the best of friends. As a librarian, what do I think of his piece? Well, I'm totally neutral about it. It's just one man expressing his opinion. What's far more interesting to me is that other librarians are not so "hot" about Gorman's article. Generally, all are saying that Gorman's articles give librarians a bad name. You know, far from seeing Gorman's article as a bad thing, I see it as an excellent case study of how bloggers are responding. Thanks to blogs, a non-librarian who bothers to do a bit of searching would likely get a more balanced view. Yet another example of the positive power of the Blogosphere. * Thanks to Singapore Serf for sending me the article. Just came back from the Singapore HRM Awards 2005 ceremony at Fullerton Hotel. The event organised by HRM (Human Resource Magazine) dished out awards to public and private sector organisations for "Best Workplace Health Practices", "Best Use of Technology", "Best Employer Branding", Best Training, Learning & Development", "Best Retention Strategies", "Best Worklife Balance Practices", "Best HR team", "Best HR Director", and "Employer of Choice". The National Library Board was one of the nominees for "Best Workplace Health Practices". If I recall correctly, NLB won the same award in 2003 and 2004. Didn't win this year. A few of the winners espoused a few consistent themes in their acceptance speech. They viewed HR as a "calling" and a driving force in the organisation's success (i.e. people were the ones who achieved results for the company, and HR is responsible for developing people). The recipient of the "Lifetime Achievement" award mentioned that HR was more than just a driving force in a company setting -- it was also a force for driving social change in a country (he's consulted for countries in HR issues). That got me thinking about libraries and the Human Resource Movement/ function: In many ways, libraries are centres for Human Resource Development, aren't they? I mean the library in both the physical sense (i.e. provision of print and digital resources, programmes and services) and also as a driver for "human development initiatives" like Information Literacy Programmes. A real-life example from NLB called "Aspiration Pathfinder" (run by some really cool folks who, in my opinion, epitomises the 'modern librarian'). Perhaps in the marketing and branding of libraries, we should seriously consider positioning ourselves as Human Development Agencies. Heck, even Human Development Consultants. For most people and most questions, Google is good enough. Case in point -- teachers who accept student assignments (filled with only web resources) also think that is good enough. People are more inclined to use Google because it has a very simple-to-use interface and has stayed consistent. In contrast, there interfaces of online databases take too much time for users to learn how to use them effective. Hence, see point 1. Like Joe's library, the online databases in NLB libraries are very underutilised. See points 1 & 2. OK, here's what Joe has to say (thanks for sharing, Joe). Last month, in a Publib posting ("Scientific American to librarians: Drop dead"), I repeatedthe assertion of Javed Mostafa, professor at the Indiana University School of Library and Information Science, that googling has become synonymous with research. We do not like this, not just because our job security may be at stake, but, more importantly, because as librarians we also know what people miss out on when they rely solely on a search engine. But Professor Mostafa is undoubtedly correct. For most people and most questions, Google is good enough. Not necessarily "best" -- not most comprehensive, not most accurate, not most authoritative -- but good enough. However, if for most people Google is indeed good enough, then this also means that for most people, whatever Google can't or doesn't find doesn't exist. And I've become convinced that for all practical purposes, those expensive online databases we librarians license do not exist for most patrons, because Google does not "see" them. My public library is probably typical -- we license Ebsco Masterfile Premier, Biography Reference Bank, Ancestry Plus, Facts.com, Grolier Online, Informe!, SIRS Researcher, Opposing Viewpoints, Mitchell OnDemand, Gale Literature Resource Center, Magill On Literature, Novelist, ABI/INFORM, Gale Business and Company Resource Center, ReferenceUSA, Gale Health and Wellness Resource Center, CollegeSource, Learning Express Library, Ebsco Newspaper Source, Newsbank, and others. We have licensed the great bulk of these to allow home access via library card number and PIN as well as use inside the library system's buildings. We promote these databases aggressively by publicizing them (including two mass mailings to the 80,000 households in our city) and by encouraging reference librarians to "sell" them in every patron encounter in which it seems appropriate to do so. When I'm on the desk, I never miss my opportunity to push these excellent resources. Patrons act impressed, nod their heads in agreement, and often seem fascinated when I demonstrate one of the databases to them. They often exclaim that they had no idea their library offered such wonderful stuff. And then they go home and google. Or at least that's what I think they do, because the numbers we're getting reported back to us by the vendors do not indicate heavy use. I will call it -- not with any originality, mind you -- the path of least resistance. Google's greatest assets aren't its coverage or methodology (though both are impressive); Google's greatest assets are its name and interface. The interface has been kept clean, uncluttered, and simple. In a digital world that daily grows more cluttered and user-hostile, Google offers one of the very few simple online experiences: You go to Google; you type in your keywords. That's it. Someone high up at Google apparently realizes the value of that clean initial screen -- how it stands as a beacon in an online world of clutter. They've resisted the temptation to load that screen up with graphical and iconic bric-a-brac (except for a little bit of the stuff humorously deployed on holidays). There's just the Google logo, plus a box in which to type search words, plus just enough discreetly displayed links for the few who are interested in digging deeper, and . . . lots of white space. Yes, we clever librarians know that there's more to Google than that simple initial screen -- advanced search features, Google hacks, and the like -- but everyday users don't care about that stuff. They take the path of least resistance. Unfortunately for us, our magnificent library databases offer anything but the path of least resistance: Our patron goes to our home page, then clicks on "Information Databases," then surveys the menu of offerings and tries to figure out which is the one she or he wants, then clicks on the link to that resource, is then prompted for her or his library card number and PIN if at home (and who wouldn't want to be using this stuff at home? ), and, then -- voila! and at last! -- is ready to enter her or his keyword or key phrase into, say, Masterfile Premier. And, then, of course, our patron may want to switch to a search in one of the OTHER databases, so there's more going into and backing out of menus, clicking links, and so on, plus she or he gets a COMPLETELY DIFFERENT INTERFACE with each database, each with its own demands and idiosyncrasies. And so our patron just googles instead. And so it struck me today: Our wonderful online products will never get the use we wish they would UNTIL GOOGLE SEES THEM. Imagine doing a Google search in which the results list includes hits in Masterfile Premier, ABI/INFORM, Newsbank, etc. Our patron clicks a hit of interest and . . .
And that's the rub, isn't it? How do the vendors get paid? How does your library "get credit" for the fact that it is your patron who has generated the hit? And, yes, I know this scheme never quite worked out with Northern Light, but . . . I'll stick to my guns: Until Google "sees" our electronic databases, they will remain a vastly underutilized resource. Because first and foremost, our patrons will google. 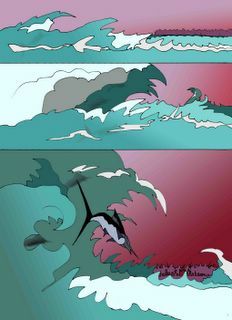 A long time ago, the seas of Singapura was inhabited by many dangerous swordfish that attacked the villagers living by the sea. The king, Raja Paduka Sri Maharaja tried several methods to solve this problem, but to no avail. A clever little boy saw what was happening and suggested the king to make a trap for the swordfish along the beach with soft banana tree trunks. 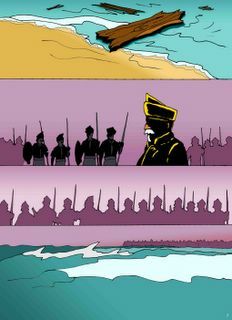 So, the Raja sent his soldiers to cut down all the banana trees nearby and built a barrier along the beach. 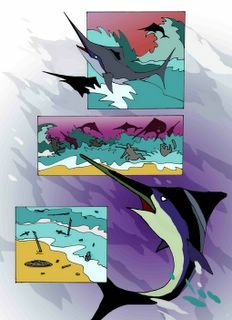 When it was high tide again, the swordfish swam up to the beach. However, instead of attacking villagers, the swordfish found their sharp noses stuck onto the banana tree trunks! 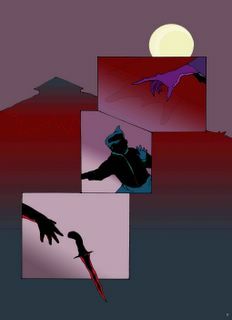 The little boy's plan had succeeded and the grateful villagers thanked the boy for saving their lives. The jealous Raja grew worried that the boy might grow up and take away his throne. So he plotted to kill the boy. 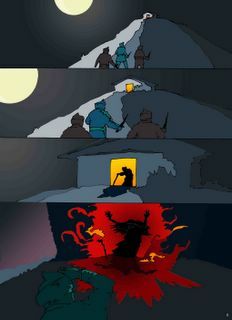 One night, he sent his soldiers to murder the boy who lived on top of a hill. 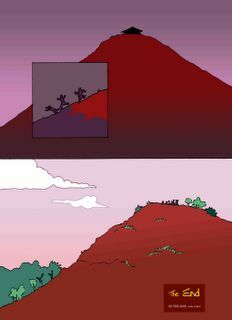 As they marched up the hill, they met a mysterious old woman who discovered their plan. She chanted some magic words and deep red blood started to flow down the hill, causing the terrified soldiers to flee quickly. The blood eventually caused the soil to turn red and the hill became today's Bukit Merah or Red Hill. Apparently there are a few variations concerning the fate of the boy. The above version is a "sanitised" one because in the version I first read when I was younger, the boy was killed and his blood flowed down the hill making it red. 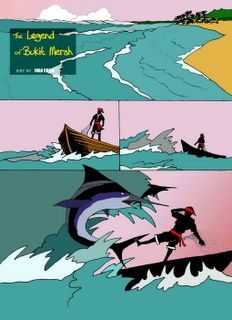 Seems there is no recorded version of the "Redhill" legend either, though the story of the attack by the swordfish was recorded in the Sejarah Melayu or Malay Annals -- a 15th century official account of the Malay-Malaccan royal lineage. In David Brazil's "Insider's Singapore" (p. 65, 1999 edition), there's a sidebar that links the swordfish story to how Tanjong Pagar (somewhere downtown Singapore) -- or Cape of Stakes in Malay -- got its name. 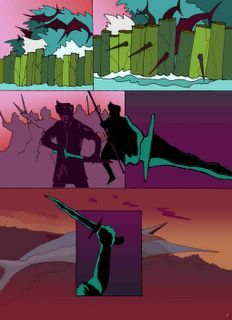 As part of BMCL reopening, my colleagues, Ivy & Hafsah, suggested that we present the story of how "Redhill" got it's name in the comic artform. 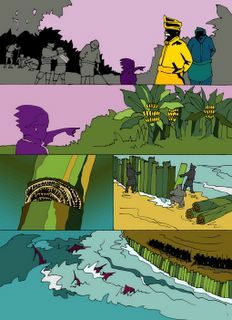 It was a brilliant idea to present an old story using a fresh approach. However, we were unable to get volunteers or freelance artists to do the comic panels for us, so I did the next best thing -- I did it myself! Took me 3 weeks' to complete it 'cos I was doing it on my own time after work, and I'm feeling pretty damn proud of how they turned out. As of this post, the A3-sized panels are being exhibited at BMCL. I've posted the smaller images below. 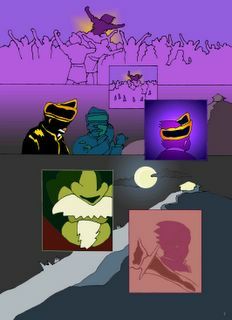 In presenting the story of how Bukit Merah ("Redhill") got its name, we chose the 'comic' art form to show that stories can be conveyed in different ways. We have deliberately left out the words so that you, the reader, can make up your own story from the pictures. Libraries have a strong association with storytelling and folktales, or more precisely, the communication of ideas and thoughts through words, sounds, and pictures. Thank you for supporting the library and continuing this tradition.